Installing and finding unofficial "homebrew" apps for Palm webOS has recently gotten much easier thanks to new software and guides. 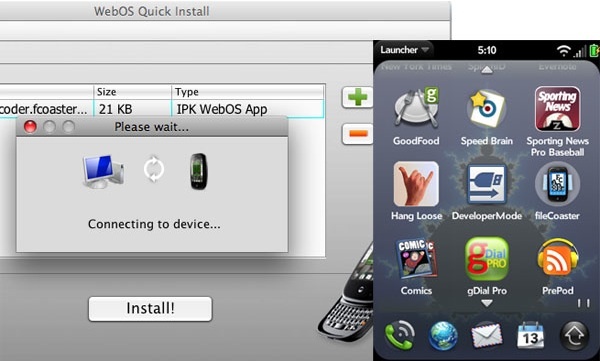 Palm Pre users on all major computer platforms (Windows, Mac, Linux) can now setup a Java application called WebOSQuickInstall. Once configured the app can install and uninstall third party applications to a Pre via a USB connection. The developer Jason Robitaille has posted a thread containing instructions on how to get setup. Depending on your system you may need to download additional files or change some settings before everything connects. Read on for the rest of our guide and recommendations. You will also need to enable developer mode on your Pre by typing (in card view): upupdowndownleftrightleftrightbastart a hidden application will appear. To turn devmode on, tap this and the Pre will reboot. Once you are setup, you can find Pre applications on many forums and other sites. PreCentral.net has recently started a homebrew directory. They also have a mobile web version. 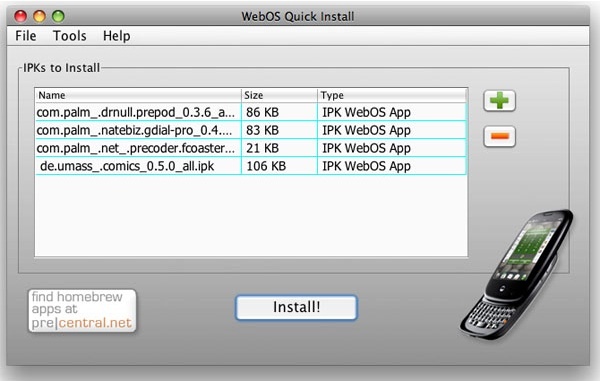 Here is WebOSQuickInstall running on a Mac. I've got 4 files ready to be transfered. A tap of the install button beams them over to the Pre. One of the first applications users should install is fileCoaster. This app lets you install applications via the web and also has an on-device app directory as well. There are already over 110 applications listed and the number has been rising quickly. 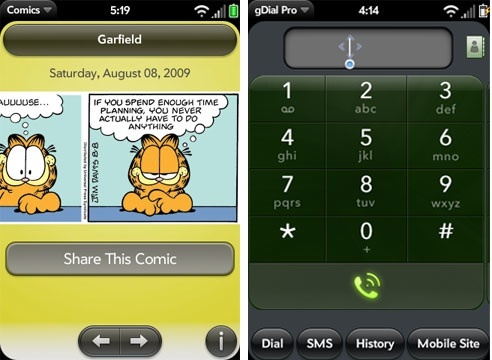 Comics is a nice app and Google Voice users will want to checkout gDial Pro. 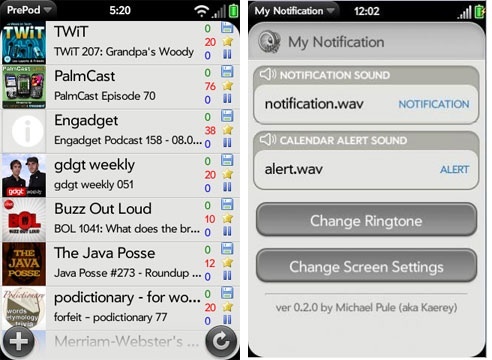 PrePod is a podcast directory and downloader, while My Notification aims to give you some more control over your notification sounds and behavior. The fact that something like this isn't officially endorsed is a shame. Honestly, I don't see anyone concerned at Palm to get a good third party software distribution together so the authors are not over marginalized as in the past. Stupid Palm. 1/2 these apps could be in their store making money for palm. That's exactly where most of them will be, when the App Catalog opens up. In certain respects, though, Palm put the cart before the horse by launching a beta App Catalog without a payment system. They can't really throw the doors wide open when people don't have a way to pay for apps. 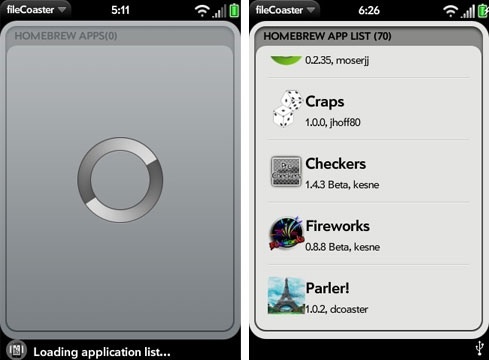 Even after the App Catalog opens, though, there will still be a place for homebrew apps. I don't see Palm letting MyTether into the App Catalog anytime soon. Not under Sprint, anyway. And Verizon is rumored to be pushing their own store, so who really knows what will be let on there? That code is totally the secret code for unlimited lives in the game Contra for the original Nintendo Game System... That mad me LOL.... It also makes me laugh that I know/remember that!